In the week or so since then, most of my time in LA so far has been something like this: learning about this thing called June gloom, adjusting euphorically to having an office with an actual window and actual sunlight in the afternoons after said June gloom, trying to buy out every single supermarket’s abundance of produce even though our Airbnb has very little in the way of kitchens, spending much more time on Google looking at traffic, and, most of all, gaping at the open, open spaces, and the endless expanse of blue sky overhead, which is as bright and all-encompassing and wrapped around you like a sunny blanket as the one in New York felt narrow and distant and shielded from you by high buildings. Of course, there’s plenty to miss about the home we left behind in New York, but I think it’s safe to say we really like it here so far. I get the sense we’ll like it even more when we move into our actual apartment (we found one! yippee!) this Saturday. It’s a happy relief. I am at my same firm, just a new (windowful!) office, and it has been an adventure continuing all my old New York cases while doing my best to take on new work in Los Angeles, so I’ll try to keep this brief for your sake and mine. But oh man, this salad. We don’t have a kitchen right now, but this was one of the last things I made in our little apartment in Brooklyn, which I was (yes) still in my potato phase but starting to veer into craving the fresh fruit and vegetables I had woefully little of in my first trimester. I’ve made potato salads with a bit of a Korean twist before, but this is not that — this is Korean potato salad, or the very delicious way you’ll sometimes find potato salad served as banchan in Korean restaurants. It’s almost as if mashed potatoes and regular potato salad decided they wanted to lend the best of themselves to a hybrid — there’s plenty of mayonnaise and a little bit of acid, as in your typical potato salad, but the potatoes are mashed rather than left in chunks, and then mixed together with vegetables, preferably as crunchy as possible, for plenty of texture and brightness. 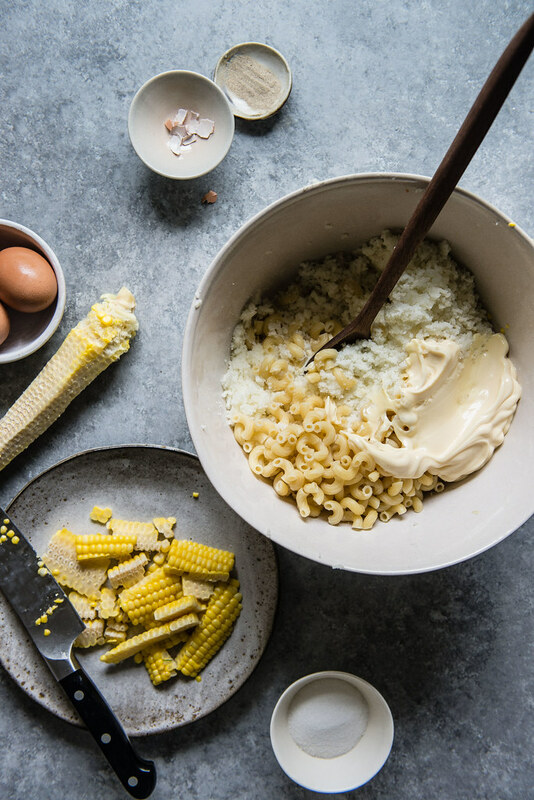 There’s hard-boiled eggs, too, for protein and bouncy contrast, and I once had a version in New York that upped the ante even more and introduced macaroni, making it even more of a motley (no, beautiful) amalgamation of all my favorite “salads,” and I couldn’t not include that here. 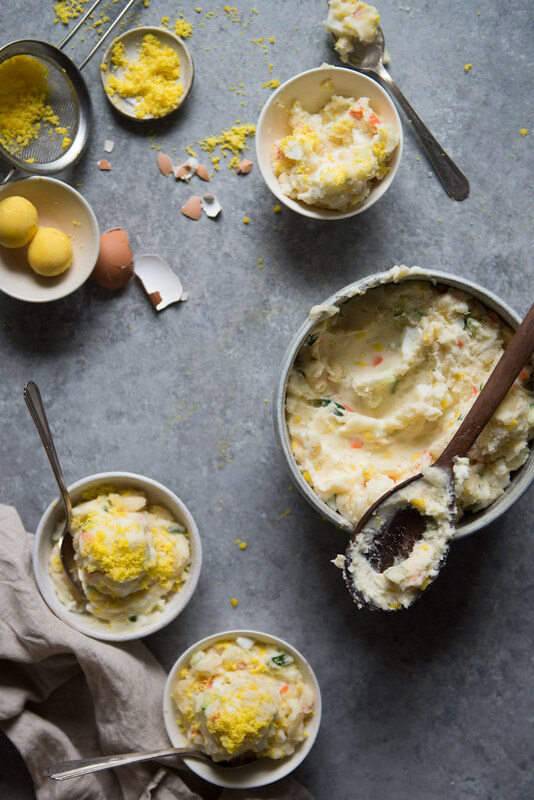 The result is a potato salad that has the creamiest, smoothest base, tangy and the slightest bit sweet, but introduces a little bit of springy chew from pasta elbows and diced egg, and crunches with lively, fresh summer vegetables every chance it gets. And it is one of my favorite things, ever. I hope you enjoy it as much as I did! P.S. Thank you so very much for all your wonderful, heartwarming comments last week. Every one made us smile so much, and B3 feel so loved. Thank you! 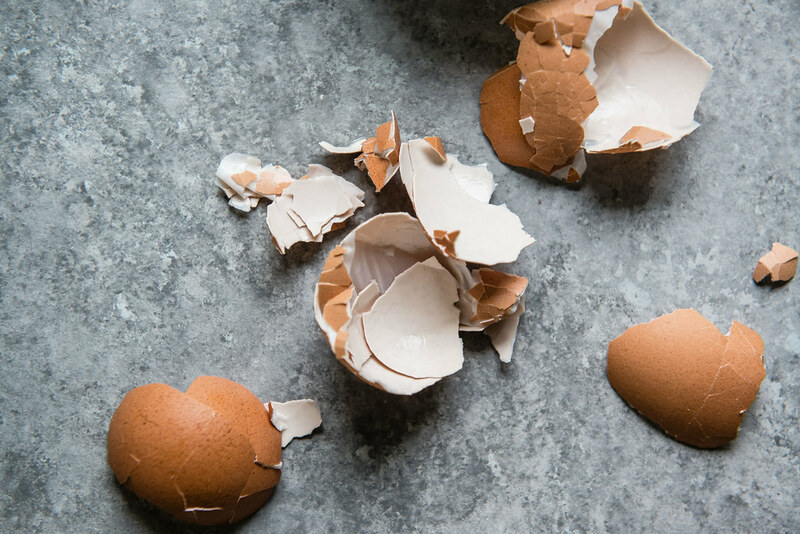 If you haven’t already, hard boil your eggs (I place them in cold water and bring to a boil, then immediately turn off the heat and let the eggs sit in the hot water, covered, for 10 minutes) then rinse in cold water and peel. Remove the yolks from the eggs and dice the egg whites, then set aside. Next, peel the potatoes (again, if you haven’t already) and cut them into roughly equal-sized pieces. I aim for pieces a little thicker than an inch, but it doesn’t really matter how big they are as long as they’re equal in size, so that they’ll cook evenly. Place in a pot and cover with cold water. Add 2 tablespoons salt, stir to dissolve, then place over high heat. Once the water comes to a boil, cook the potatoes for 15-20 minutes, or until a fork slides through with little resistance. Meanwhile, cook the macaroni (if using) according to package directions, drain, and set aside. Optional: Sprinkle salt evenly over the diced cucumber and let sit to draw out some of the water. After about 10-15 minutes (right around when the macaroni and potatoes should be nearly done), squeeze out any excess moisture. When the potatoes are fork-tender, drain well and run them through a potato ricer, or else gently mash with a potato masher, pastry cutter, or even just a fork. 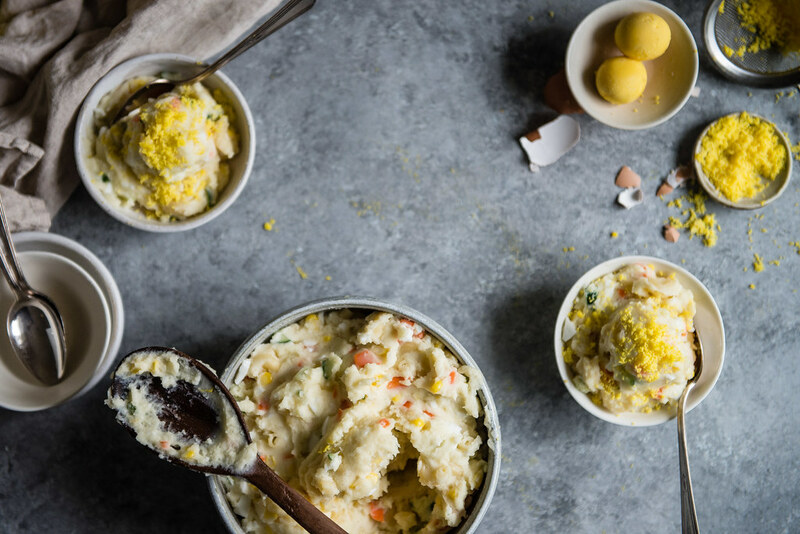 A potato ricer will give you the creamiest consistency without making the potatoes gummy, but if you like some chunks, mashing with a fork would work just as well. 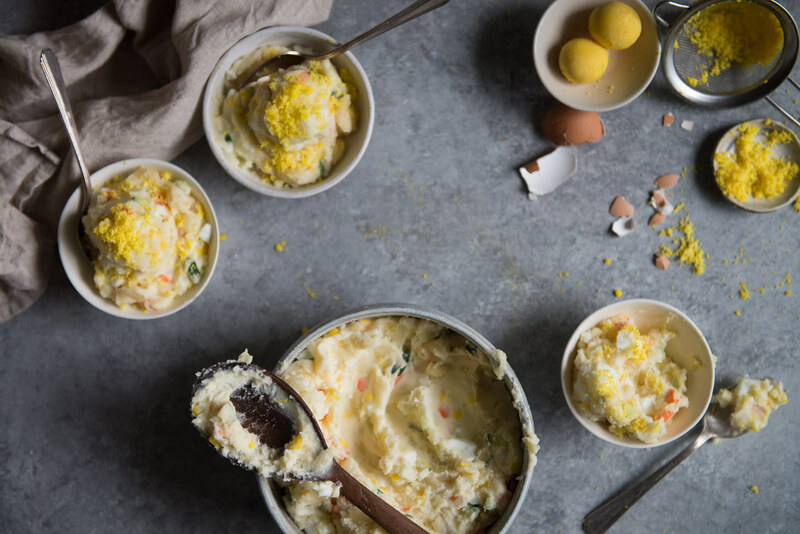 Add the cucumber, minced carrot, sweet corn, diced egg whites (reserving the yolks), mayonnaise, sugar, and white ground pepper to the potatoes and mix with a spatula or wooden spoon until smooth and well-combined. If you like, you can add a splash of lemon juice, which I find adds a bit of welcome tartness (see Notes for other suggestions -- you can also add diced apple, or a bit of yogurt). Let cool at room temperature, then refrigerate until ready to serve. Just before serving, press the yolks through a fine mesh sieve or grate them over the salad. Enjoy cold. A number of recipes call for diced apple or pear, which I think would be fantastic here -- I simply omitted (in a rare instance of self-restraint) because my salad was a little busy already. Aeri’s Kitchen calls for some lemon-lime soda or Korean drinking yogurt to add that bit of tartness, which sounds amazing, too. I like Kewpie mayonnaise for its slightly sweeter and tangier flavor, but you can, of course, simply use regular mayonnaise in its place. For a lighter alternative, replace half the mayonnaise with Greek yogurt. This is such a cool combination of flavours! I can’t wait to try!! yay, i’m so glad you guys like la so far (: and this is one of my favorites! when ever i see it at kbbq places, my table always ends up getting 3-4 refills of this one. Congrats on getting an apartment! You must be so stoked on having so many Korean places to try out – please make a list soon! Ooh, I should have clarified! Yes, I gave my corn a quick boil. 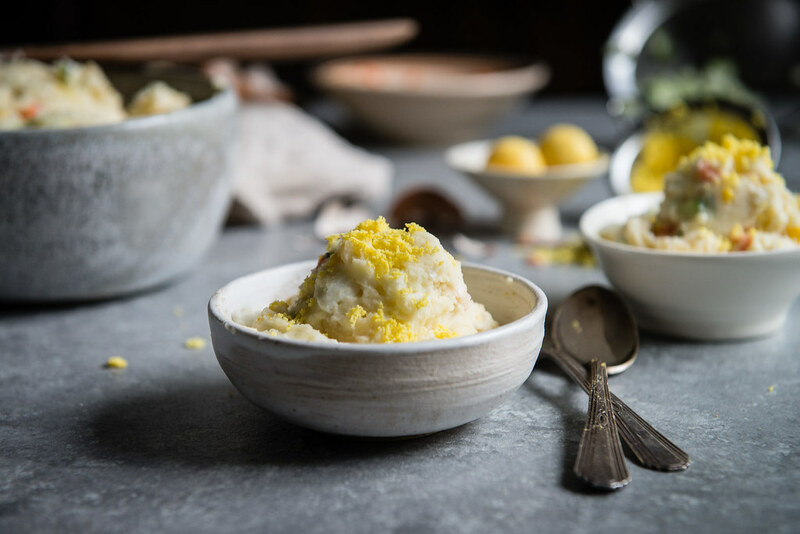 You can also use frozen sweet corn (although maybe not until after all this recall business has been sorted out…) Thank you for catching that, I will edit the above! So darn exciting, Cynthia!! I love that you have a gorge new office with beautiful light! Also – YAY to short flights to Hawaii from now on!!! (it’s 5 hours to Hawaii from Vancouver – oh I’m dying to go again.) So great you guys found a place!! (please send me pics to my email? Hehe!!) Lotso love! I haven’t been here for a while and so many things has happened. You moved! Wow! I actually miss this part of my life a lot – moving. I am trying to figure out where to move even for a few months with Mia. The only disadvantage – I’ll miss kindergarten time, which is my free time 😀 The salad looks and sounds awesome! I keep clicking on this post when I think about it just so you know that I LOVE it. I always hope that you keep making food that feels like a hug no matter what. Glad to hear you’re settling in to LAlife. I’m going to be making your baby announcement fries soon so super excited about that! I’ll let you know how it goes. Happy almost Friday! I seriously can’t wait to meet up with you (hopefully soon)!!!! So so delighted to hear you’re liking it here so far, and I bet the less extreme weather has you hooked already. And I’m not kidding when I say this is one of my ALL TIME FAVORITE banchans at restaurants….next to seaweed salad, this is way up there. There’s just something about the tang and slight crunch from the additional veggies that make it so delightful and addictive. Yes! My mom is Korean and this post gives me all the feels! 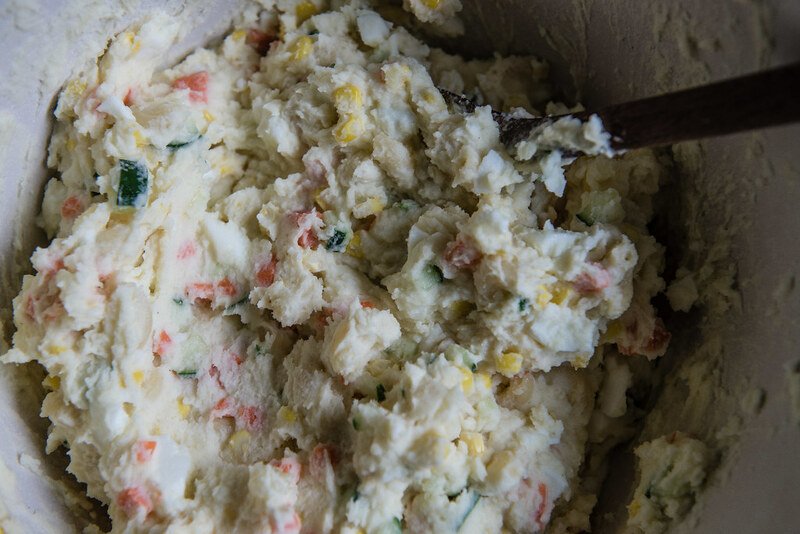 and makes me want this potato salad, right now. I made it before and for two people there were extra servings and lasted a couple days. I’m about to make a new batch with new twist. It’s good to get fresh ideas or re-do techniques. My bf is Korean so we have been eating a lot of Korean homecooking in addition to other Asian foods cuz I’m oriental myself. Your photos are candid and appealing, showcasing a variety of lifestyles. Oh NO on the peeler accident (I’ve lost many a layer of skin to the mandoline, that fickle friend) but oh YAY that you liked this salad!!! That makes me so tremendously happy–thank you so much for letting me know and so glad you enjoyed.